Posted on January 4, 2011, 3:19 pm, by Thomas Hawk, under Podcast. 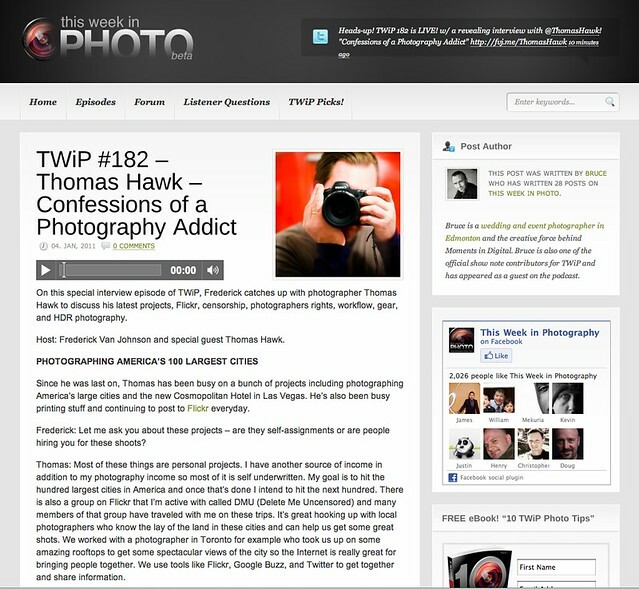 I had a nice opportunity to sit down and do an interview recently with my good Pal Frederick Van Johnson who does the excellent This Week in Photography podcast. We talked about alot of different subjects including Flickr, my 100 largest American cities project, censorship and photographer’s rights issues and lots of other stuff. It was great catching up with Frederick and talking about the passion that we both share for photography. You can check out excerpts from the interview and hear the original podcast here. Posted on July 11, 2009, 2:01 pm, by Thomas Hawk, under Photography, Podcast. My Pal Robert Scoble and I did a podcast interview with Ron Dawson over at F-Stop Beyond that just went up. It was an engaging conversation about a lot of different topics related to photography and online photography. We talk about how both Scoble and I got started in photography, talk about how Scoble and I met, as well as terms of service issues with photo sharing sites, censorship issues with photo sharing sites and definitely spend a bit of time on the show pimping our favorite site FriendFeed. You can check the podcast our here. Posted on July 8, 2009, 1:25 pm, by Thomas Hawk, under Photowalking, Podcast, Thomas Hawk. I had a blast last week as a guest of the Cameradojo podcast talking about my photography, my workflow, and especially my own personal goals and ambitions with my photography last week. Kerry Garrison and David Esquire host the show and do a great job at what is really more of a long conversation than an interview. Really appreciate you having me on the show guys and looking forward to catching up in person the next time I’m down in Orange County!